Yes! More ridicule. Whining from the creduloid god-bots is sure to follow. All of existence is a beautiful kind of magic really. The existence of light bulbs, human beings, and the love between families – brought to you by the laws of fundamental elements of what began as a primordial fireball – impresses me more than a hypothetical person who could actually levitate. It is cosmological magic. The black hat is space-time fabric, and Adam (mankind) is the rabbit. Yeah Alex, kinda like magnets, right? Miracles everywhere. inb4 long post complaining about Luke’s blog. Yes, magnetic fields as well. And yes, there are miracles everywhere as Creation itself is a miracle. Being all serious for a moment: Robert Wright’s Evolution of God (reviewed unfairly by Jerry Coyne IMHO) gives an account of early-stage religious utility that builds on the basic problem of governance for groups larger than a few hundred people. David Sloan Wilson in Darwin’s Cathedral (excoriated unfairly by many) has a similar time line and Pascal Boyer expands the arguments in Religion Explained. 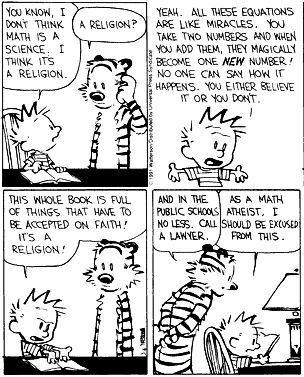 But that seriousness aside, I think the inability to admit to non-understanding on the part of adults in Calvin’s dad is one of the reasons he always gets such low public opinion ratings in Calvin’s polls. Any attempt to explain a phenomenon as complex and diverse as religion with a single cause is almost certainly false. I don’t think anyone should think the tongue-in-cheek title here exhausts Luke’s opinion on the matter. I doubt that not one iota. I’m actually curious as to how apologists and religious folk conceive of the existence of other religions and how they came about. Are they all generated by Satan as part of an elaborate ruse in Xtian thought? Thus Satan must have been deviously at work for tens of thousands of years leading people away from monotheism even before monotheism had been conceived or, as they might alternatively argue, revealed? Why would there be an urge towards shamanism and interest in the divine if the true nature of the divine was inaccessible? Young Earthers with Warfare Theodicies might get some coherence here (at the expense of all other fact and history), but they require so many concessions about likely facts that they are hardly representative. MarkD – how they came about? Its surprising to me that you would be curious about this. How familiar are you with any religious tradition (besides maybe Fundamentalist Christianity)? A religious person can believe in evolutionary accounts of religion, whether cultural;y or biologically based. Even exclusivist religious people also tend to believe that people are in some broad sense *spiritually* oriented to at least recognize the divine. So it doesn’t tend to surprise religious people that many different cultures have a way of conceptualizing, and a ritualization of, the divine. Per your shamanism comment – ummmmm, does someone need to know the “true nature” of something, to believe in some concept of it, worship it, etc.? I don’t fully understand your response. I’m quite familiar with a range of religious traditions, but few of them tend to speculate about other religious traditions in their dogma. Instead they mostly either build upon them or are non-intrusively accepting of the idea that others believe something different from them–a kind of parallel play. The traditional way of coping with others was syncretization, co-existence, or conversion. Per the shamanism issue: sure, one need not understand anything to worship (hence the mysterious nature of faith), but I am curious whether modern Xtians (and likely Muslims) conceive of that “primitive” belief as merely misguided, as influenced by Satan, or as something else? Even Biblical language tends to be obscurantist in declaiming other gods at some points while suggesting they simply don’t exist in others. Obviously there are gradients of modern belief that allow for acceptance of differing faith systems and origins stories, but how is it that they reconcile the problematic discontinuities? Sure, religious folk are able to accept naturalistic accounts of other religions. Their own religion? Well, that’s another matter. Their own religion is True. No doubt you think science can give a total-nothing-to-be-desired explanation of lamps, vacuums and everything else, while those of us who know anything about philosophy know that the mindset of scientism fails in principle. Luke — You absolutely must be a guest on the TWiT network show Fourcast. They talk about this stuff all the time. Take Alonzo or one of your other compatriots along. Tom Merritt and Scott Johnson would go bananas. MarkD wrote: but few of them tend to speculate about other religious traditions in their dogma. Alex: Are you familiar with the universalist and inclusivist theologians of such traditions, who are often some of the greatest intellectuals within the tradition? Taking Christianity for example, heard of John Hick, Clark Pinnock, etc.? Read either? If so, there’s your answer. And yes, conservatives often will see demonic activity at work. Again, on Shamanism, it depends on the religious tradition you’re talking about and where one falls on a spectrum of belief about boundaries of inclusion/exclusion. Regardless, you have not presented any problems of coherence for any theological system. Rob: Sure, religious folk are able to accept naturalistic accounts of other religions. Their own religion? Well, that’s another matter. Their own religion is True. Alex: Something like a religious inclination or disposition in man being described naturalistically has no real issue being reconciled with an allegedly revealed religion. God made humans to commune with him; this is how we do it. Evolutionary accounts of religion don’t address the actual historical origin of the tradition itself, but rather the behavior and faculties of man that make the basic notion of religion palatable. And quantum mechanics was not discussed in my cell biology class. Mythology and folklore studies are probably your best bet if origins of particular traditions are what you are after. Rob – my point was that there is nothing in naturalistic accounts of the origins of religion that mitigates against the veridicality of any particular religious tradition. Thanks for the tip on mythology and folklore, but Eliade and Campbell already take up space on my shelves. I think it might be safer to say that there is nothing in naturalistic accounts…that mitigates against…an extremely non-literal universalist collection of beliefs. New Agers do that too and its hard to argue against broad metaphors. Lumpers versus splitters. Still, the vast majority of religious believers’ beliefs remain interesting to me. MarkD – The context of the thread is the origin of religion per se, not the veracity of the doctrines of all of the various religions. But of course, a metaphysically naturalsitic explanation for any specific doctrine within a given religion is going to confilct with a presumption of divine revelation for said doctrine. That’s not to say that a metaphysically neutral naturalistic account of a phenomena that has a religious description need cause problems for the latter. Let’s consider a hypothetical situation. Suppose I believe God created the world from nothing, and science confirms a certain Big Bang model of the origin of the universe where physical existence emerges from nothing. Suppose we can even describe this event mathematically and understand it in an entirely mechanistic fashion, all the way back to the singularity. Suppose we can even understand scientifically how something might emerge from nothing. The proposition “God created the universe” would then not be in conflict with a fully naturalistic account of the event. Maybe so, Alex, but the probability that any creator god could have come into existence is so vanishingly small (essentially certainly less than 1 part in 10^500; see http://zenofzero.net/docs/IiIndoctrinationinIgnorance.pdf ) that sensible people reject the possibility as nothing but silly speculation. I’d like to add the note to Luke: It’s a real treat to see you use Watterson’s creation. If you want more, similar fun, have a look at my final-four, summary posts in my series on “the God Lie”, starting at http://zenofzero.blogspot.com/2010/10/closing-comments-1-origins-of-god-lie.html : for the fun of it (and I mean that literally), I loaded them with Calvin and Hobbes strips! How amazingly fortunate we are that Watterson was true to himself. Nick222 – I agree that all sensible people should reject the possibiliy of God “coming into existence”. Classical theism does not posit any such thing nor do any of the major monotheistic religious traditions; they posit that God is eternal, without beginning or end. That anyone would even write an article (also riddled with other flaws), a calculation of which is based on such a premise, betrays the kind of ignorance of theism that I am growing to expect when I read the writing of atheists. Show me a theist who believes God “popped into existence”. Alex: Sorry not to respond earlier; something didn’t work with the subscription button; even now, I wouldn’t have seen your post, but I just happened to drop by on a Calvin and Hobbes tour. Anyway, with respect to your request to show you a theist who believes God popped into existence, I agree with the thrust of your challenge that it’s difficult to do so. I attribute my inability to identify such theists, however, not only to my lack of an encyclopedic mind but mostly because apparently most theists (including you?) can’t seem to think past their useless assumption that “God is eternal, without beginning or end”! Thus, for one, notice that such a god is easily eliminated using Occam’s razor: if it’s proposed that God is eternal and made the universe, then the assumption that God exists can be shaved by the simpler, single assumption that the universe is eternal. Second, notice the inconsistencies in the assumption that such a god is eternal and then “one fine day” decided to create the universe. The logic is faulty not only because, if God had been around for an infinite time, then never would “one fine day” occur but also because, if there was no energy before God made the universe (which is made up of equal amounts of positive and negative energy, e.g., see http://zenofzero.net/docs/Awareness.pdf ) then there would be no time (see the same reference) and no “fine day” would ever have occurred. That is, the concept of ‘eternal’ is meaningless. Consequently, the only reasonable assumption to make is that God popped into existence from nothing, but then, the probability that such would have occurred is vastly smaller than the probability that our universe popped into existence from “total nothingness”, which was (and still is) my point.